I know it’s been ages since the last blog post, and I apologize, but I do have somewhat of an excuse. I will continue to catch up on what happened after we listed our house for sale, but first I need to give you a quick update about what’s been going on lately. You see, Tim had to have surgery. Yes, surgery! It’s been a bit of a setback for us, but he’s doing well and is recovering in Loveland, Colorado. A few weeks ago, Tim started to experience pain in his neck and shoulders, as well as tingling in his left arm and fingers. He soon recognized the symptoms as nerve pain resulting from a pinched or irritated nerve root in his spinal cord. You see, he had a similar issue about eight years ago that resulted in surgery. As the pain continued to increase, Tim realized that he would have to do something about it. On Monday afternoon, June 23, he contacted the surgeon who saved his life during his cancer surgeries, and she and her nurse went out of their way to schedule an MRI and an appointment with a neurosurgeon. Amazingly, all of this took place within a period of just two days. We quickly returned to Loveland for the MRI on Wednesday morning, and then met with the neurosurgeon that same afternoon. The verdict – surgery was really the only option to correct the problem. Surgery was scheduled for the following Tuesday, July 1, and we left Loveland on Friday with a supply of pain pills, to attend Tim’s high school reunion in Fort Morgan, Colorado. (I’ll write about our great weekend there in a future post.) We returned to Loveland on Sunday night, and Tim checked into the Medical Center of the Rockies on Tuesday. The neurosurgeon performed a posterior cervical discectomy to remove pressure from the nerve root in Tim’s spine. Surgery went well, and Tim was only on the operating table for 27 minutes. He was moved to a hospital room, where he stayed for observation for two nights. Medical Center of the Rockies is a great hospital and is Tim’s hospital of choice in Northern Colorado. We were so fortunate that we were still in Colorado and could return to Loveland for the surgery. 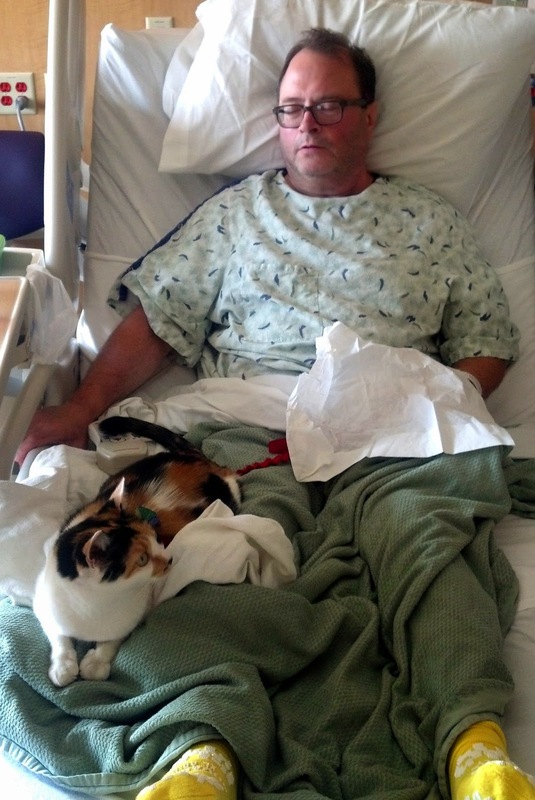 We were surprised to find out that MCR is a pet-friendly hospital, and Kitty was able to visit with Tim. Although Tim is still in a lot of pain at the incision site, the nerve pain has virtually disappeared, and he has started to regain more strength in his arm. We are expecting his recovery to go smoothly. I’ll write about that and the issues we’re dealing with in the next post.